Online Weapons Training | Master The Katana! No other weapon in the history of warfare has developed the level of mystery, glamor, or attention than the Katana - the Sword of the Samurai and Ninja of ancient Japan! Are you looking for training that will allow you to Master this powerful weapon? Well, now you can. And you can learn from the comfort of your own home! 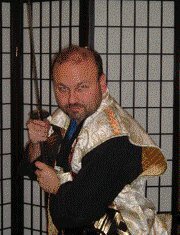 Hi, Shidoshi Jeffrey Miller here, with a personal invitation to join me and other serious, like-minded, students as we explore the Path to Mastery with the Japanese katana - more commonly known as the Samurai Sword. Regardless of whether you already have experience with the Katana, or you're just getting started, this new online weapons training program will give you what you need to take your Samurai sword training to the next level - and beyond! Guaranteed. But, before I discuss the program, let me ask you a few questions. Okay? What is it that attracts you to the sword? Can you see yourself wielding this powerful, ancient weapon with all of the skill, agility, and expertise of a true warrior? For centuries, the sword has been the symbol of strength, power, command - the symbol of the True Warrior. It symbolizes everything from Knighthood and the status of the "Bushi," to the attainment of success, and the passage to manhood. How would mastering the Samurai sword change your martial arts and self defense training for the better? What would you be able to do with these new skills? And, what would it feel like to have this ability - to know that you were no longer just a "fan" of the Japanese Samurai sword, but an accomplished swordsman in your own right?! Can you imagine the confidence, power, and sense of personal control that you would feel, knowing that you "owned" this skill? What would others say when they saw you effortlessly cutting through targets, and demonstrating these skills? How much differently would others speak to, and relate to you - knowing that you were a skilled Master of the Japanese Sword? You are not the only one who thinks this way about the sword. Not by a long shot! This admiration of the Samurai sword, its ability to cut through flesh-and-bone like a hot knife through butter, and what it represents to each of us, on a deep, subconscious level, is practically hardwired into us as human beings! ...in the hands of a skilled Master Warrior who knows how to use it correctly! And, I have been asked time and again, if I would consider putting together a Master Sword Training course - a program focusing just on the Samurai sowrd. Many of the students who come to me for help in learning the skills of the Samurai and Ninja are scattered around the world, and they have little to no access to a certified master-teacher. They have no one close enough - no qualified teacher near them from whom they can learn the secrets, lessons, strategies, and tactics for using this amazing weapon. And, they want to train in the worst way. Do you know what they're going through? I know I did, many years ago, when I first began training in the Warrior arts of Japan. Because, when I began training, I was in the same place. No school or teacher within hundreds of miles from where I lived! So, I spent literally $100,000.00, thousands of hours, and over 30 years of my life traveling to train with those who had the secrets that I wanted, to be able to attain the level of Mastery that I have. And, up until now, only those students who lived locally, or those who were able and willing to travel to be at one of my training seminars or yearly, Spring and Fall Ninja Camps, were able to learn these secrets from me. But now, with the power and technology of the internet, you can too! This 10 week course is part of my online weapons training and coaching program. You can register for just this module of training and Master the Samurai sword, or enroll as a full coaching student and learn all of the other weapons that will be taught during this ongoing Master's Level series. Note: If you are already one of my "Inner Circle," Online Platinum Coaching Program students, do not register for this program, as you will already receive it at no additional charge - as a part of your Platinum Training Benefits Package. This program is open for enrollment right now But ONLY FOR A LIMITED TIME. And, the best part is that this program is 100% digitally delivered. That means that all of your classes were pre-recorded at a live event, digitized, and made available as a self-paced, online training program! And, for those of you who have trained with me before, you know that I give as much value as I can in every program that I teach. Differences between the way the Samurai used his sword, and the way a true Ninja would! But you're not going to pay anywhere close to that for this course. And, to make it as easy as affordable as possible, I'm making a special offer this week only. That's over 94% off the total value for this course. But... if you enroll in this program before the end of the week, I'm talking an additional 50% off the already discounted price. ...for the full training course, INCLUDING all of the bonuses I'm throwing in. So, when this week is over, so is this special offer. I'm doing this because, like I said, I want to make it as available as possible to my serious students but, as I said, I'm doing this as a special tuition rate for this week only. You'll see that you are literally getting 2 courses in ONE! And... for less than $15 per class! And, that's if I keep the cost at $297 $147! Simply click on the PayPal Button below and, after completing your payment, you will be directed to a page to complete the registration process. This may not be the right time for you to take this course. And that's fine. It will be here when you are ready - but not in this exact form, and not at this price. This will be THE ONLY time that I'm offering this course at this price, this way, and for you to get the free email coaching with me as a part of your program. But, if you are ready right now to get this powerful training, go ahead and click on the PayPal Button below to lock in your place before the price goes back up to $297. If you miss the deadline, PayPal will show the regular price instead of the discounted one. Ready to increase your level of Mastery with the Katana - the Japanese Samurai Sword? Click on the PayPal Button right now! 5 Bi-weekly Payments of $37 each.